If anyone has not noticed or is interested, the Aventura and Horizon models have received an update. The build number of the current OS version. Ray has updated the Canary OSM map. - Thanks to Ray. In the new download for this month, the latest route closures for Germany and Switzerland are now available again. A new line closure was added. PLEASE NOTE: The location of the *.bmp and *.bwpt file has changed! Both come in the RADAR folder but only from TwoNav v.4.x.x! Thanks again to Christian for the changes. Now there is a German provider, which offers a complete screen protector for the Aventura. More in the section "The Aventura"
The well-known navigation software QVM from QuoVadis has received a new feature! For smartphones with iOS and Android, the new card format QMV (QuoVadis Vector) has been added. QMV also offers the possibility to use a routing file, QMR for short. Thus QVM can now also "correct offline Routing"! 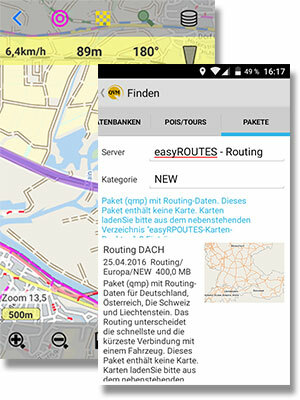 Also QuoVadis 7.3 and EasyROUTES 4 QMV maps can be displayed and created for QVM. The whole thing is rounded off by a download offer of finished "free" map packages in QMP format. This possibility exists both from the App QVM out as well as in QuoVadis 7.3 and EasyROUTES 4! A short introduction can be found HERE (only in german)!